Amazing Large stone bastide in Roquefort les Pins , charming town near Valbonne, Cannes and Nice. Entering the large stone bastide via the majestuous alley way surrounded by a mature garden with beautiful trees , gives you the feeling that you are going to live a special and exceptional holiday in a very very exceptional place. 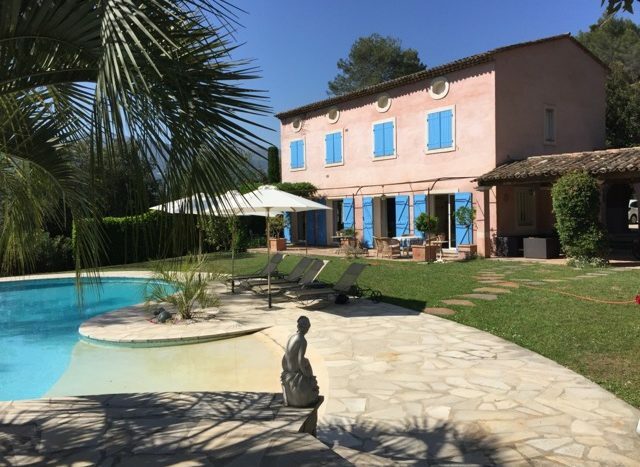 This fantastic amazing large stone bastide comprises of 4 bedrooms in the main house and 1 studio apartment for guests. Therefore, it can welcome 2 families willing to share a peaceful and lovely holiday on the French Riviera. It is located in a very residential area away from the city but still close from Valbonne, Cannes and Nice. The front of the house allows parking for a few cars. The Bastide has a lot of character inside and outside . The entrance opens onto a large dining area and living room furnished with taste. The living room has 2 lovely sofas sitting in front an old open fire place. The Provencal type kitchen is fully equipped with high quality electric oven, microwave and cooker. It opens onto the summer kitchen where it is all taking place: The lovely BBQ ,the beautiful family dining table and the salon. You can let your imagination go, thinking of the family diners al fresco during the hot summer nights. Garden : 2500 m2 mature trees , lots of flowers, private wood . Children games. The bed line and bath towels are provided.